Sen. Lindsey Graham (R-S.C.), one of President Trump's closest Senate allies, on Wednesday criticized the president's recent rhetoric toward North Korea and expressed concern about ongoing negotiations on North Korea's denuclearization. "I'm worried that North Korea's dividing us from South Korea. I'm worried that we're being played here. Now I'm telling you, President Trump, enough with 'I love you,' " he said while speaking at the Atlantic Festival. "From my point of view, this love crap has to stop. There's nothing to love about Kim Jong Un," the senator added. Graham's comments were in reference to statements Trump made at a rally in West Virginia on Saturday in which he praised North Korean leader Kim Jong Un. "I like Kim, he likes me. I guess that's okay, am I allowed to say that?" Trump asked. "That was a big, big problem, and you know the interesting thing, and when I did it, and I was really being tough, and so was he, and we're going back and forth, and then we fell in love. No really, he wrote me beautiful letters, and they're great letters. We fell in love," he added. Graham said he was worried that such rhetoric could hinder progress made between the U.S. and the rogue nation. "I don't know how this ends, but we're into another round of engagement, and here's what I worry about: you get sucked into the love thing and nothing changes. So he has really created a hard choice for himself, President Trump," he said. Trump and Kim held a historic summit last June in Singapore, negotiating North Korea's denuclearization. Kim has returned three Americans that had been imprisoned in North Korea as well as what the White House says is the remains of fallen U.S. service members from the Korean War, and the country has not held any missile or nuclear tests since the summit, but the hermit nation has made no tangible progress on dismantling its nuclear arsenal. 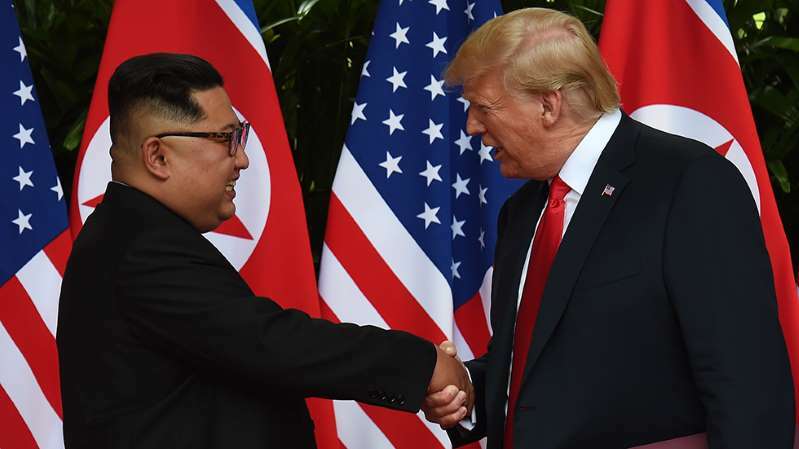 However, Trump thanked Kim early last month for saying he would denuclearize before Trump's first term is up and praised the North Korean leader, proclaiming "We will get it done together!" Trump also claimed that Kim has requested a second meeting. The rapport between the two leaders marks a 180-degree turn from their relationship last year when Trump dubbed Kim "little rocket man" in reference to North Korea's nuclear and missile tests. Secretary of State Mike Pompeo is set to meet with Kim next week as part of his upcoming trip to Asia. The two are expected to discuss a possible second summit between Kim and Trump.